Spray a 2 or 3 quart baking dish with nonstick cooking spray. Set aside. Use a serrated bread knife to cube bread into bite-sized pieces, about 1 inch squares. Add bread cubes to prepared baking dish. Sprinkle with most of the chocolate chips, marshmallows and crushed graham crackers, reserving some of each for later. In a mixing bowl, add eggs, chocolate milk, sugar and vanilla. Whisk to combine well, and pour mixture over bread cubes. 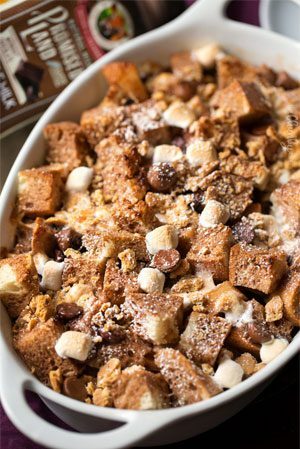 Carefully stir up the mixture of bread cubes, chocolate chips, marshmallows and graham crackers. To the top of the bread, add the remainder of the chocolate chips, marshmallows and crushed graham crackers. Cover dish tightly with foil and refrigerate overnight. Preheat oven to 350 F degrees. Remove casserole from refrigerator and let sit on counter to warm up. Bake for 25-30 minutes, until golden brown. Dust with powdered sugar and drizzle with maple syrup if desired.